In the days of my own homeschooling, early August was when my family and I sat down in earnest to decide what exactly we wanted to be part of my curriculum that year. While I’ve now completed my undergrad with a degree in English, I still feel the pull to research textbooks and compare lesson plans. 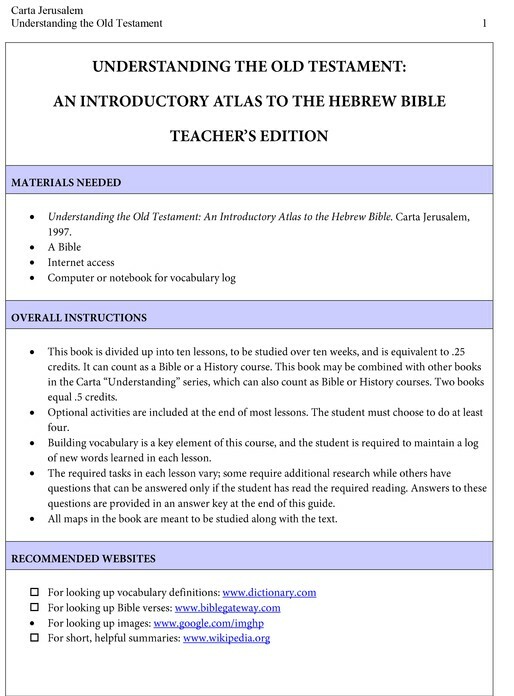 Those of you in the same boat may appreciate a quick look at the homeschool materials Hendrickson offers in conjunction with Carta Jerusalem. Carta, a long-established publisher of cartographical material for biblical study, partners with Hendrickson to make some of its titles available as homeschool courses for students in grades 9–12. With teacher guides written by Dr. Amy Paulsen-Reed, an editor at Hendrickson and herself a former homeschool student, these books belong on the shelves of any homeschooling family with a desire to deepen their students’ knowledge of biblical history. The Carta teacher’s guides can be used by parents with their students; however, they’re designed for a homeschooled student to be able to work out of by him- or herself. Each is divided into lessons that include a section of reading from the main text, a written response, and occasionally an extra assignment or activity. Some of the courses include relevant movies for students to watch, or encourage students to seek out people from the cultures or religions they are learning about. Understanding the Geography of the Bible and Understanding the Old Testament by themselves are 40-page introductory atlases of the ancient world of the Bible. With the help of the teachers’ guides, which divide each book into ten lessons, these books can be combined to form a .5-credit high school course in history or the Bible. Students will explore the climate, geography, and culture of the Mediterranean basin with Understanding the Geography of the Bible and learn about the history of Israel and the Ancient Near East in Understanding the Old Testament. In each course students are asked to keep a vocabulary log of words they have learned and to occasionally utilize outside sources to further explore new topics. 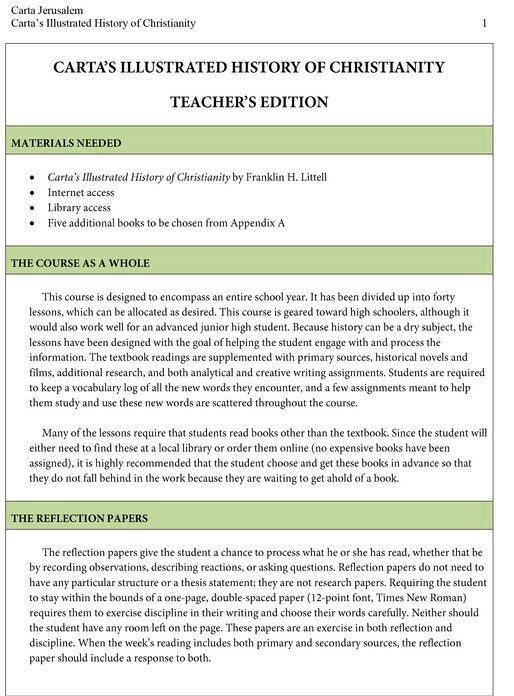 The teacher guides include review questions and an answer key, as well as recommend various sources for different types of research. Carta’s Illustrated Josephus: The Jewish War is the most “college-preppy” of all the Carta homeschool products for high schoolers. The course may count as a history, Bible, or writing credit. 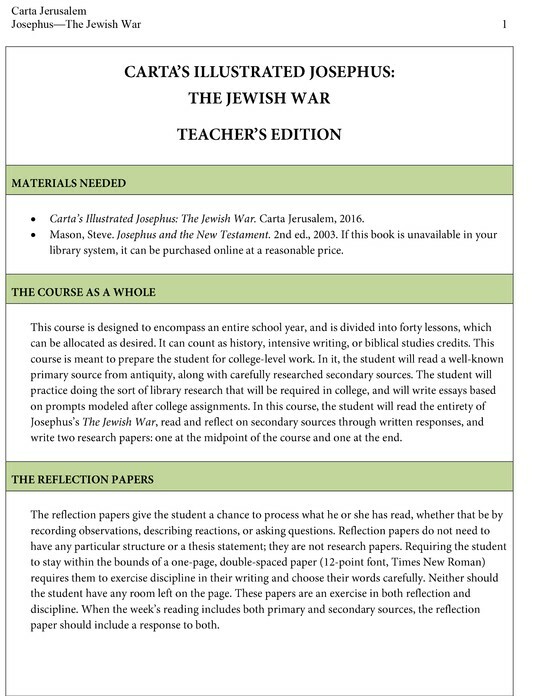 Josephus is a primary source on its own; the teacher’s guide instructs students to study secondary sources alongside it. In fact, the first lesson directs the student to find a relevant book at their local or college library. A written response is assigned to each lesson, and the final project of the course is to write a research paper that discusses the validity of Josephus as a historian—a topic still debated in academic circles. When combined with the teacher’s guide, Carta’s Illustrated History of Christianity becomes a year-long course in biblical history. While other resources are required as part of this course, they are available at most libraries and are not expensive to purchase. This syllabus is designed with a variety of student preferences and personalities in mind—it allows students to choose between interactive and research assignments on occasion and to learn through their creative abilities by writing poems or cooking recipes based on what they are learning in the course. I can say for sure that these books would have been fantastic additions to my own homeschool curriculum—not, however, just because of the subject matter. I would have benefitted a great deal from learning earlier on how to work out of both primary and secondary sources, as with the Josephus course. Too, I would have loved to study more material that not only provides a thorough look at the history of Christianity but also demonstrates how it fits into the history of the world. These four books are by themselves fantastic historical, geographic, and biblical resources; Hendrickson’s teacher guides open them up to high schoolers and their families for extended study in a way that both challenges students and allows them to exercise the knowledge and skills they already possess. For more information about these four teacher’s guides, visit our website!